I want to display some ad script in the footer of all pages, except in the Register.php and Login.Php. is there html / js code that i can use to implement ..? Do you still need it? I can try to make it. Use .my_ads class in case you need to customize CSS. YourAdsGoHere -- here go your ads. (!) use double quotes à la " " inside to avoid any breaks. It were better if I could make this part not repeating twice. If I have any idea, I'll notify you. now the appended "my_ads" div appears in footer but I cannot check if google ads work. Some time's needed before the advertisement starts to display for users. you can check if the div is appended properly by adding some css styling to it. is there any script that can be used to display topic description ? I've enabled the "HTML in posts" option in my forum to allow video embeds. However, that script wraps whatever is added between the [html] bbcode tags in an <iframe> that does not have the "allowfullscreen" attribute. Result is embedded videos cannot be viewed fullscreen. 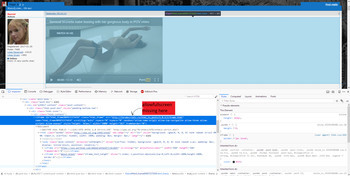 Can that script please be modified so that the iframe wrapper includes the allowfullscreen attribute? I tried to set allowfullscreen data to the current script with jquery, but no luck. This is a messy a little bit, but you may use different script, probably disabling current. You must specify allowed usernames to prevent major security issues. Then you do not need to use any tags, add html code like you do it on admin-options page. Note. This script works poorly with new lines for HTML, if you make some it is likely to break your html. Prob any html-compressor may be useful. Excellent, thanks, that alternate script works just fine! Oh, and thanks for wrapping the preview images I had posted in a spoiler; totally neglected NSFW, sorry. I think it's easier to use HTML in posts for this purpose and then insert the code you need. Because global changes for the whole service are very unlikely.